Pick you up from hotel in Shanghai by our private driver, transfer to airport and fly to Guilin. Your pivate English-speaking guide will welcome you and pick you up from airport and then transfer to your hotel. Free time for the rest of day. Today we do sightseeing inside the Guilin city. First visit the Elephant Trunk Hill. It is symbol of Guilin and got its name because its shape resembles an elephant with its trunk drinking from the Li River. Then is the Reed Flute Cave, which is regarded as the most impressive cave in Guilin. Lively shaped limestone formations look fantastic under the colorful lights. Finally come to the Daxu Ancient Town, one of the four famous historical towns of Guangxi province. Take an excursion minority tour to Longsheng. 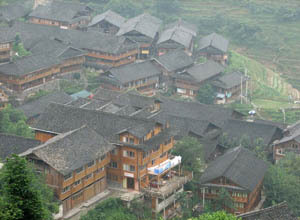 We will visit the Longji Terraced Field and the Zhuang and Yao Minority Tribes. The terraces look like ribbons as they wind from the foot to the top of mountains, vast in area, twisting off into distance. Zhuang and Yao minority villages dot the area. The different minority customs and dress are especially interesting. Back to Guilin for overnight. Today is the highlight of this trip-the Li River cruise down to Yangshuo. Everywhere along the river has pricturesque scenery, like grotesque peaks, clear water, bamboo groves, rice paddies with water buffaloes, as well as fishmen on bamboo rafts. After 4-hour sailling, arrive in Yangshuo county, an old town with thousand years’ history. Free time for you to explore the charming town. A pleasant stroll on West Street is strongly recommended. It is an old street and now famous for its nightlife with bars, restaurants, shops that are mostly opened by foreigners from all over the world. Relax in the Yangshuo countryside by cycling to pass through the paddy filed and orchards that surround the famous mountains. It is a fascinating insight into the life in rural China. Fly back to Shanghai in the afternoon. Your Shanghai driver will pick you up in time at Shanghai airport and transfer to hotel. End of our service. *Hotel charges in Guilin and Yangshuo.